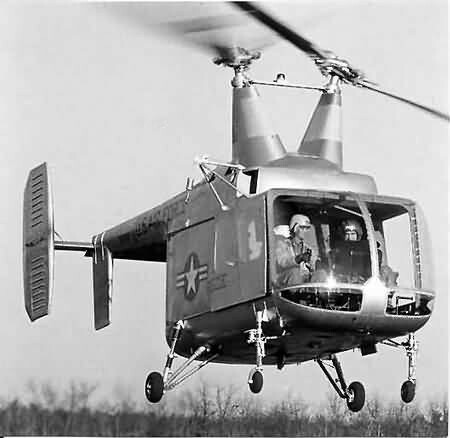 29 May 1958 first HUK-1 accepted from production ; first flight ?? 14 Dec 1958 58-1842 H-43B 58-1842 crashed (“Aviation Week” 22 Dec 1958). 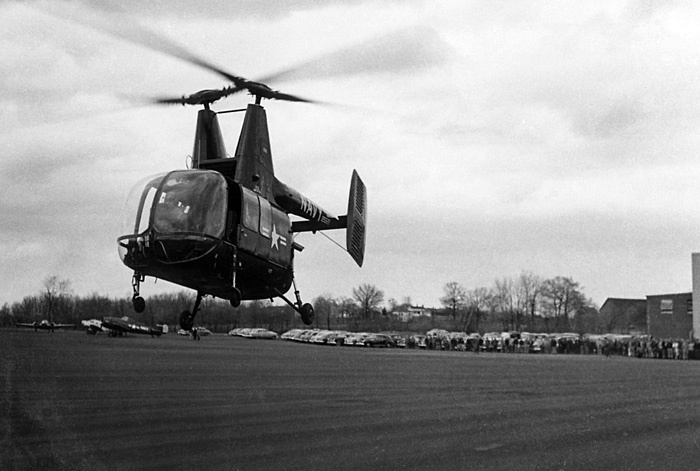 It was scheduled to participate in an official rollout at Bloomfield, CT on 16 December 1958. The accident was near the conclusion of a rigging and tracking test flight. Rollout , now with 58-1841, was planned later, because 841 was torn down to be instrumented. Development of the tail construction for the HOK-1 and later for the H-43A and B was done over a couple of years, starting in 1953. With Central fin, with fentral fins mounted on the tail boom, or dorsal fins, or both. HOK-1 125528 , seen here at Bradley Fld, CT during first acceptance on 28 April 1953. 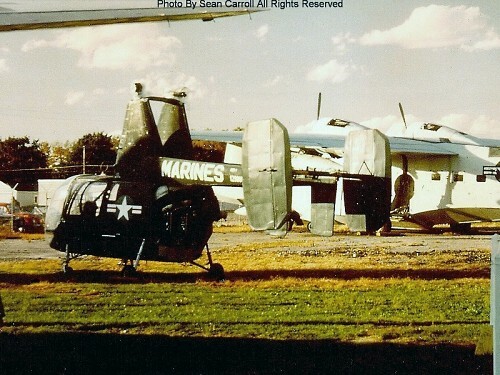 The "NAVY" title was later replaced by "Marines"
HOK-1 125530 , Kaman Photo 1020-1 , 30 Aug 1955 ; note the "Bear Paws"
HOK-1 129801 , Oct 1973 , seen on display at the Bradley Museum grounds, with modified tail configuration. Photo taken and provided by Mr. Sean Carroll. 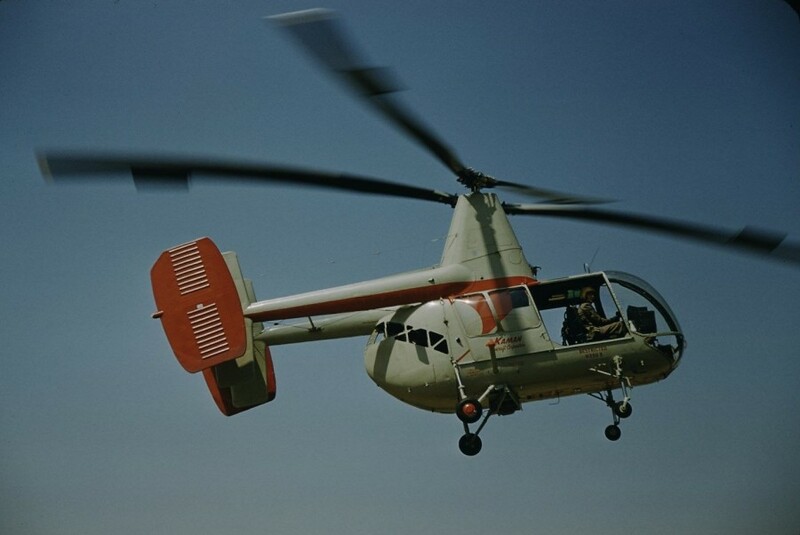 First flight of standard HOK-1 129801 with prototype servo tail installed, dated 11 Aug 1958. Ventral fins installed on the tail booms (no dorsals). Wide tail and no central fins. Second flight on 12 Aug 1958. Both flights by Chief Test Pilot W.A. Newton. The report ends : "In way of conclusion and without delving into details as to reasons, it is strongly felt that the dorsal fins should be a firm requirement in the "B" helicopter". 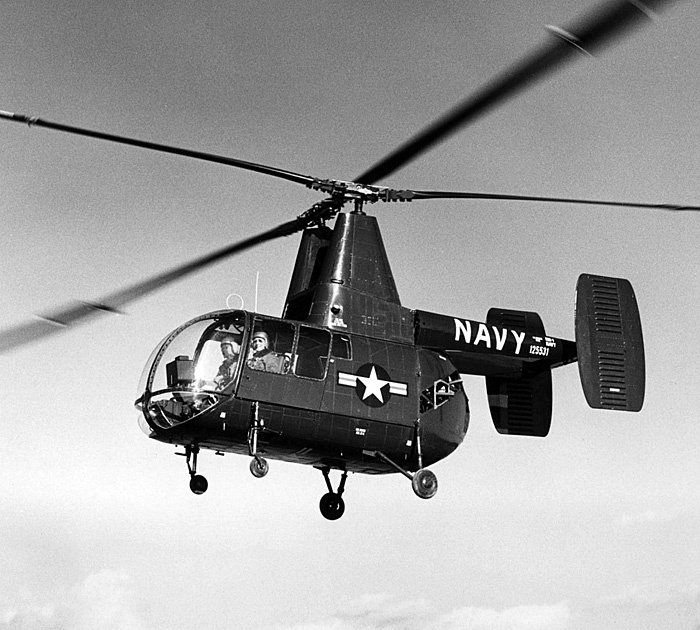 It was also adopted as such for the H-43A. This tail configuration of 129801 was also mentioned in a Report about flight tests undertaken over the period 29 July-27 Aug 1958. Other participating aircraft were HOK 125528 and H-43A 58-5524, which flew the major portion of the test flights. Mr. Rita's comment : Diagonal braces like that shown in the picture were used for a number of test related purposes ranging from safety considerations such as providing for test purposes an added measure of rollover protection for the fuselage crew compartment in the event of an incident as well as configurational assessments in the development testing of the HOK for obtaining vibratory airframe flight test data to help in defining the necessarystructural interface between the lower cockpit tray area and basic fuselage structure. As to why it was remounted in the aircraft when given to BradleyMuseum, I can only surmise that it might have also been last used to provide comparison vibration data for a/c 129800 which was involved in Vibration reduction at the time. Usually, at the end of a contract, when an aircraft is disposed of by the Government, all sorts of bits and pieces associated with it's use, and paid for by the Government, go with it. Never the less, It's not the brace that ends up as the subject, but that of the Cabin Door Sill Gusset, primarily with it's configurational necessity, removal for the HUK and H-43A fuselage configurations and lastly the H-43B and it's current configuration of necessity. The HOK as designed has a large cabin door capability such that the extended lower tub area is the primary forward structure with minimum loads carried by the forward cockpit canopy frames and pilot's overhead roof. However; while adequate structurally, initial cockpit and pilot station vibration data indicated that an increase was required in it's flexural stiffness for minimum cockpit and crew station vibration levels. 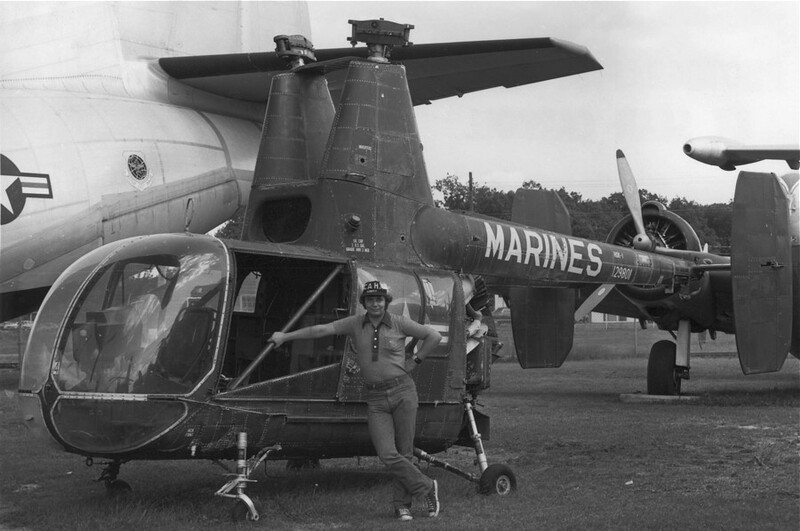 While it's obstruction was not an issue for the Marine's HOK mission, it needed to be re-considered in light of the HUK and extended SAR and Plane Guard requirements. 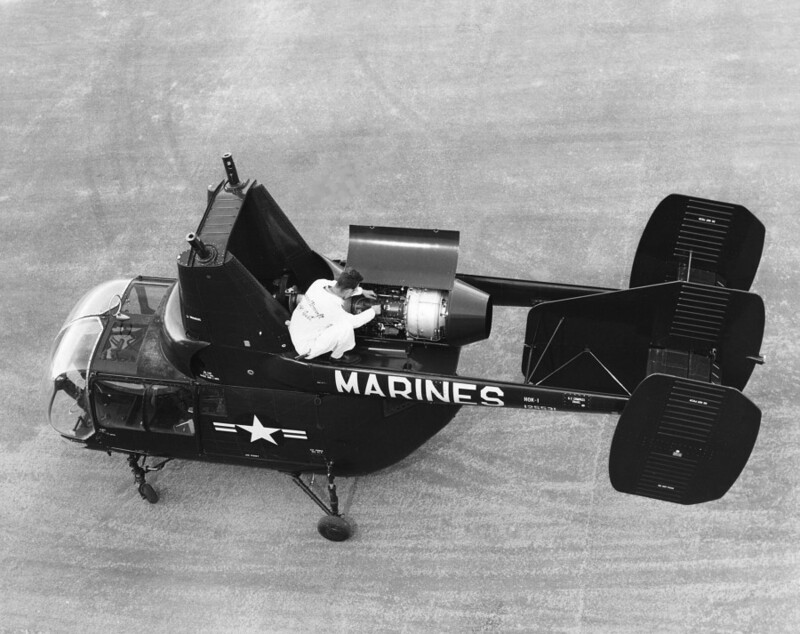 Shortly after the HOK Carrier Evaluation Program (05 May-06 Jul 1956) with two modified aircraft with wide doors, a Kaman Engineering Change Proposal (ECP), titled "Removal of Cabin Door Sill Gusset", dated 27 Aug 1956 was approved for both a block change for subsequent HOK-1 orders( a/c s/n series 139xxx and above) and it's addition to the list of ECP's and changes approved for Model HOK-1 helicopter as part of the detail specification for the HUK helicopter. Mr. Rita : with respect to the tail pipe configurations, the short "Sugar" scoop used during the HOK 125531/T-53 development program was the same configuration used for the first flight in mid December 1958 and during the tie-down test, after which it was replaced with an extended straight long pipe section to prevent the up-ward oriented exhast gases from affecting the rotor's flow characteristics and contributing to adverse rotor induced airframe vibrations as well as diverting the exit gases to obtain a thrust benefit to help offset the added tail pipe's weight penalty on the aircraft's C.G. and an added longitudinal cyclic control benefit. 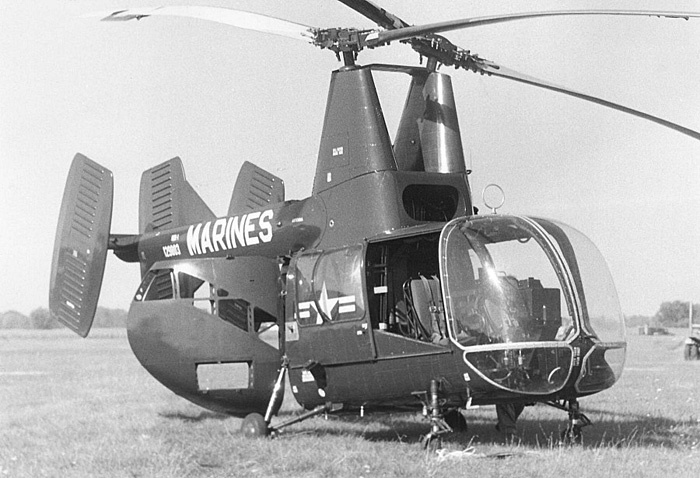 With respect to pipes exit configuration, or thrust diverting feature, there were three iterations during the life of the H-43B. The initial shown in the Mar 25th photo (see above) which was primarily to exhaust the gases with the latter two associated with modification to the exit diverter and angle. 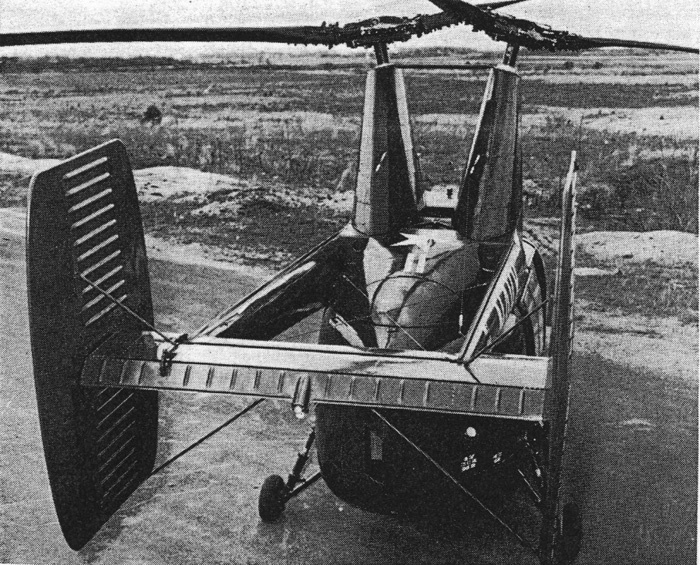 See Rotor Tips, July 1960 for a discussion of the second configuration (with aircraft 58-1846 in the Dec59 - Jun1960 time frame) and, lastly, the final all-up H-43B tail and exhaust pipe configurations (with 58-1849 between Oct1960 to Jun61961. The H-43B Category II/III system evalu­ation tests were conducted jointly with the Air Defense Command to provide an operational and functional evaluation of the Support Sys­tem in a typical base environment. This report covers 340:20 hours of a planned 500 hour test. The test was terminated early because of a succession of rotor blade-to-tail interference in­cidents. Testing of the secondary mission - fire suppression - was delayed due to the blade-to-tail interference problem. A series of rotor blade to tail interference inci­dents have occurred. 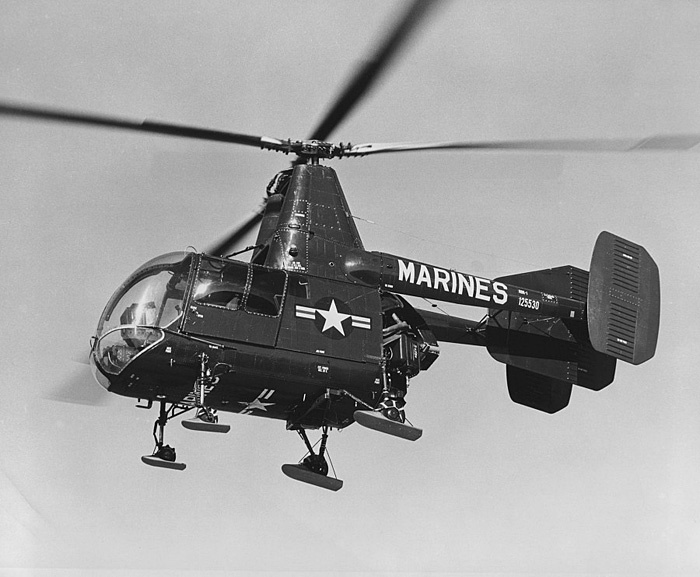 Three rotor to tail interference incidents occurred at Kaman Aircraft Corporation between September 1959 and March 1960. The fourth incident occurred at AFFTC on 4 April 1960. One of the right rotor blades clipped the top 2 inches from the right rudder and vertical stabilizer assembly while making a nose down slope landing on a 14 degree slope. On 18 April 1960. Stead AFB, Nevada re­ported an accident involving rotor-tail interference while the aircraft was hovering in a crosswind. 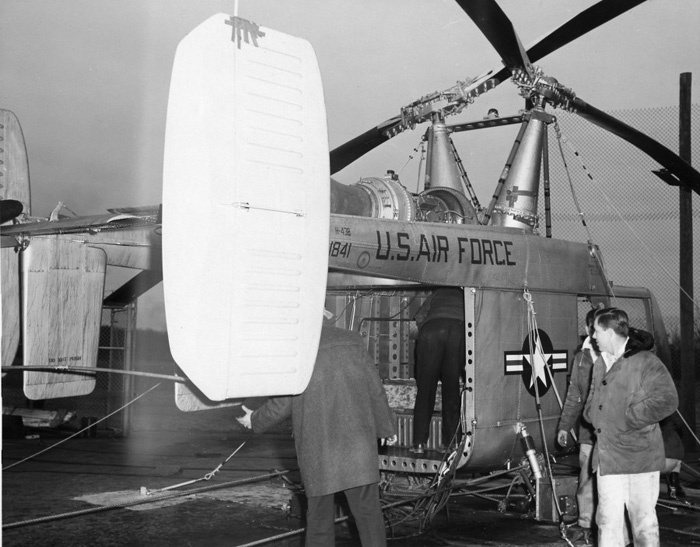 On 29 April 1960, Stead AFB, Nevada re­ported a second accident invoking rotor-tail inter­ference while the aircraft was in aurorotative flight. The AFFTC recommended grounding all H-43B's on a May 1960 because of this problem. 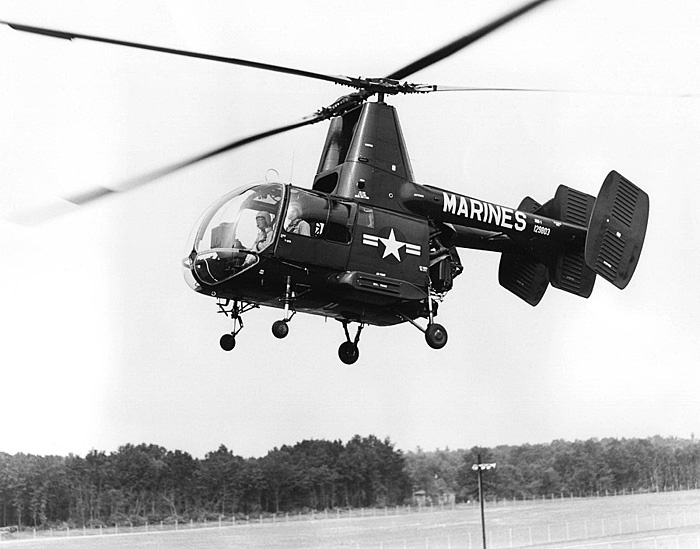 Rotor-tail interference was experienced at Kaman Aircraft Corporation on 4 May 1960 during a slope landing. As a result of these incidents all H-43B's were grounded on 4 May 1960 in accord­ance with T. O. 1H-43B-518. (A 14). 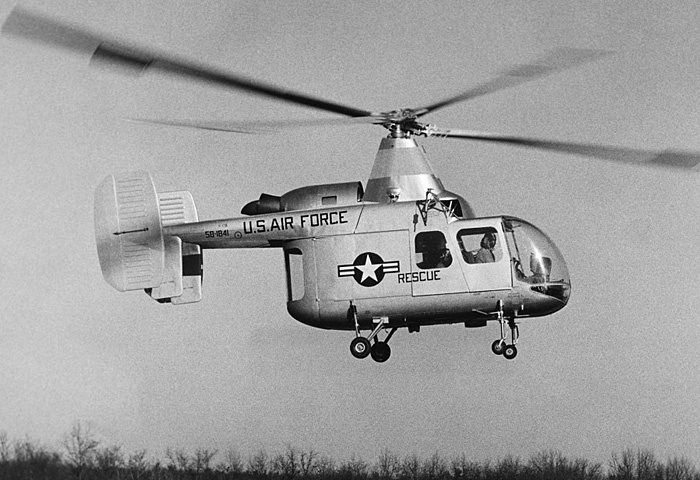 The Kaman Aircraft Corporation, builders of the helicopter, said the new vertical tail surfaces are 14 inches lower than on previous models. The new tail design eliminates two vertical surfaces located on the upper surface of the stabilizer and reduces the height of the helicopter's two rudders. Surface area is maintained by the addition of two fixed end plates located 20 inches outboard of the rudders.